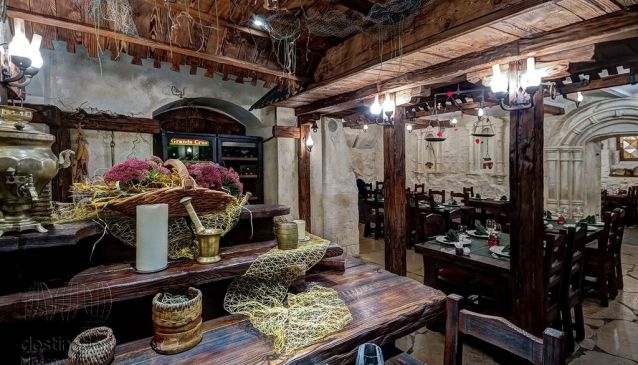 The off-road location of Kitezh-Town restaurant down in a basement of an 18th century historical building is an interesting coincidence one can mark when learning about the wonderful legend of the invisible town of Kitezh. It refers to the time of the 13th century when the Russian town of Kitezh vanished from the enemy attackers' sight having gone under water right after the church bell chimed. The town became invisible, still it can miraculously open to the eye of people with pure heart. Those who can enter Kitezh-town and eat and drink what it offers become super powerful in body and mind. Charmed by this legend, follow the route and find Kitezh-Town, the restaurant. It is actually not hard as it is well signposted off the street. You walk downstairs and enter the old Russian time atmosphere - the interior is decorated in a 17th-18th century theme with massive wooden furniture, traditional Russian samovar, ancient books and other accessories of the past times. The waitresses welcome you dressed in loose linen costumes of that period. From the daily hustle of the world up there you get immersed into a nice and quiet atmosphere of old Russia to relax and enjoy genuine Russian dishes and authentic Russian music. Start from a glass of bread-based kvas - back in the tsarist Russia it used to be an everyday drink. You might as well try tasty berry juices - cranberry or seabuckthorn. Russian winters famous for its long cold presuppose dishes with lots of meat, poultry and fish. So, even for a starter you can choose among patties (pirozhki) with meat or fish (rasstegai), pancakes (blini) with salmon or Siberian dumplings (pelmeni) stuffed with meat, game or fish. A variant for vegetarians is dumplings with potatoes, mushrooms and fried onions or patties with apples. It is to note that soup is a highly respected and significant meal in Russia which is traditionally served as the first course. So, if you come for lunch and you really want to try it the Russian way, soup cannot be avoided. In Kitezh-Town enjoy famous borsch (beetroot-based soup with meat), delicious ukha (fish-soup) and other. For the mains the menu has a wide selection to suit most tastes - beef stroganoff, venison in hunter's style, bacon wrapped lamb and duck in exotic sauce for meat lovers. Fish eaters will be impressed with pike with spinach or tsar's sterlet served with rice, cedar nuts and caviar sauce. All this warms you well coupled with interesting home-made drinks, for example khrenovukha (horseradish vodka), gooseberry or cedar infusions, or just shots of the world famous Russian vodka. The beer is not at all forgotten; moreover, you can taste Russian wines. A romantic dinner, friends' gathering or another special occasion - whatever event is, Kitezh-Town will provide a delightful dining experience with the finest Russian cuisine, hospitality, and service.